PRPUE Automated tourism technologies - official website. All the health resorts, recreation centers, exkursion and hotels of Belarus. Private research and production unitary enterprise Automated tourism technologies was founded in the year of 2007 as a Belarusian tour operator, which specialzes in inbound and domestic tourism. In 2012 and 2013 the company was awarded the highest award of the Government and the President of Belarus - Winner Best Entrepreneur in the sphere of tourism of the Republic of Belarus . On the Internet-portal Sanatorii.by the information about all health resorts of Belarus (more than 100 resorts) is presented with their detailed description, photos and video, medical profiles and the basic methods of treatment, medical-diagnostic offices, infrastructure. The Internet-portal BelTur.by it is devoted rest in Belarus, here it is possible to find all bases of rest, tourist complexes, houses of the hunter and campings (more than 150 objects), located in natural landscapes of the Belorussian nature, in National parks and the wildlife preserves fascinating with the beauty. On the Internet-portal BelHotel.by are presented all hotels of Belarus (more than 250 hotels) with the detailed systematized description. By means of the portal You can reserve hotel any categories, located in any city of Belarus. The Internet-portal Ekskursii.by offers various on subjects and duration of excursion routes across all Belarus (more than 140 tours) for individual tourists and corporativ groups. Familiarity with the richness of the past and the beauty of the castles and temples, national parks and reserves. The Internet-portal Belusadba.by is devoted to the rest in farmsteads in Belarus (about 50 farmsteads). All farmsteads located in small villages, farms or on the large cities outskirts. Rest in the in beautiful nature near the rivers and lakes, familiarity with the traditional rural life and national cuisine, treats with natural products, carefully grown in private households. The Internet-portal BelHunt.by allows hunters from around the world to experience the wealth fauna of Belarus and the ability to order a hunting trip at affordable prices in one of the hunting leases (over 50 organizations). On the Internet-portal BelTransfer.by we offer You the services in the transfer organization between all cities within the country, and also the organization of trips on each city of Belarus, including a transfer from the airports, railway and road service stations in any point of the country and back. The Internet-portal Visafree-belarus.by let to consult the procedure of visa and visa-free entry into the Republic of Belarus. Information about visas is conveniently systematized depending on the residence country of foreign citizens who will planing to visit Belarus for tourist purposes. The Internet-portal Belarus-online.by gives possibility plan all stages of travel across Belarus: from the documents, necessary for entrance on the territory of the country, to a choice of points of a food, attractions, entertainment, shopping centers and other services. Possibility of a portal to keep all information in the Travel notebook is available from all popular social networks, this function is supported by computers and smartphones. Online Booking - all websites recreation facilities available with the price and creates a convenient booking system, with which You can book tours or book travel services to any selected object (health resort, recreation center, farm, hotel) online. 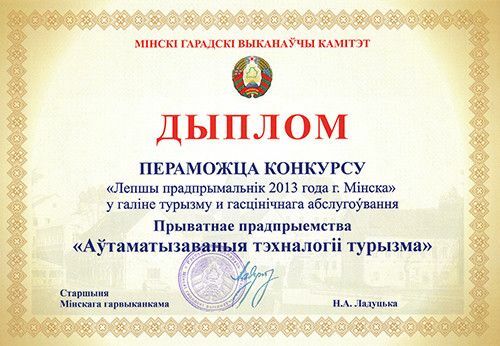 Certificate and awards - our company is certified for tourist activities and noted diplomas and letters. About our work you can read on our Forum. Republic of Belarus continues to attract foreign visitor and provides an opportunity to visit the country without a visa for a period not more than 30 days. Foreign citizens from 80 countries (Lithuania, Latvia, Poland, Germany and others) сan benefit from visa-free regime in planning a tourist trip to Belarus. The visa-free regime with staying up to 30 days applies to visitors who arrive to the National airport Minsk by plane. The visa-free entry to Belarus with staying up to 10 days is valid for visits of the tourist and recreational zone «Brest» (Brest city, Brest, Zhabinka, Kamenets, Pruzhansky districts of Brest region, Svisloch district of Grodno region) and the tourist and recreational park «Avgustow Canal» (Grodno city and Grodno district). 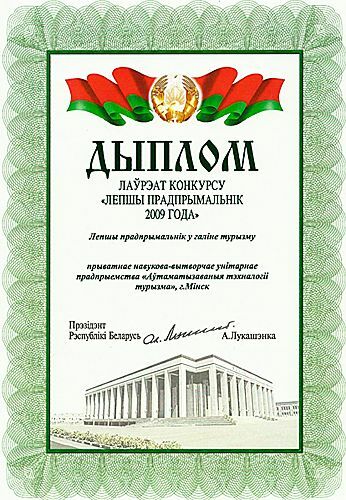 In order to enter the visa-free territory a foreign visitor should possess the document which is issued by Belarusian tourist agency. Belarusian tour operator "Automated tourism technologies" offers a full travel services and issue documents for visa-free entry. Book online wellness tour in the health resort, excurcion tour around Belarus, hotel room or weekend tour in the tourist complex of farmsteads, sport or bussines tours. Republic of Belarus, a hospitable country in the center of Europe, invites guests! There are lots of things to surprise guests! Immerse yourself in the fascinating travel around the country of blue lakes, endless forests, clean cozy cities and their open-hearted tolerant inhabitants. Discover amazing Belarus! Learn more about its culture, cuisine, nature, transport system and tourist sites. This information will help to prepare for the trip and make it bright. Belarus is proud of wild nature and carefully protectes it in major national parks and reserves in Belarus. The rich history of Belarus, from the first principalities to the present, is reflected in many unique architectural masterpieces, part of it is included in the UNESCO World Heritage List. Medieval castles, majestic temples, ethnographic complexes and military sights have a special value. Thanks to natural resources and developed infrastructure Belarus has excellent opportunities for recreation and treatment, eco-tourism, holding international festivals and competitions. Health resort >«Alfa Radon» does not cease to please its guests with pleasant bonuses. When booking a tour for the period from May 15 to June 15, 2019 , all tourists are provided with three effective procedures as a gift . On April 1, 2019 the Law «Improvement of the legal regulation of gambling business» will will be aproved in Belarus, it allows the organization of online gambling. What changes will the market meet and how to use them with maximum benefit? Iy will be the main topic of discussion at the Minsk iGaming Affiliate Conference. The international festival of traditional culture «Braslavskiye zarnitsy» will be held in May 2019 in Braslav. The event «Braslavskiye zarnitsy» combines the spirit of authenticity and the Middle Ages. Guests of the holiday will see performances by amateur groups of Belarus and neighboring countries; will be able to participate in folk rituals, old-time fun and master classes in traditional crafts and medieval dances. The event will also include the celebration of medieval culture «The Sword of Brachyslav», during which fascinating battles of knights, a torchlight procession will take place. In May 2019 in the temples of Mogilev international festival of sacred music «Magutny Bozha» will be held. The main event of the festival are traditional competitions of vocalists, choral and vocal groups. The contestants will be valuated by famous cultural figures from Belarus, Russia, Ukraine, Germany, Poland and other countries. Also during the festival exhibitions of spiritual literature, conferences, master classes and much more are planned.